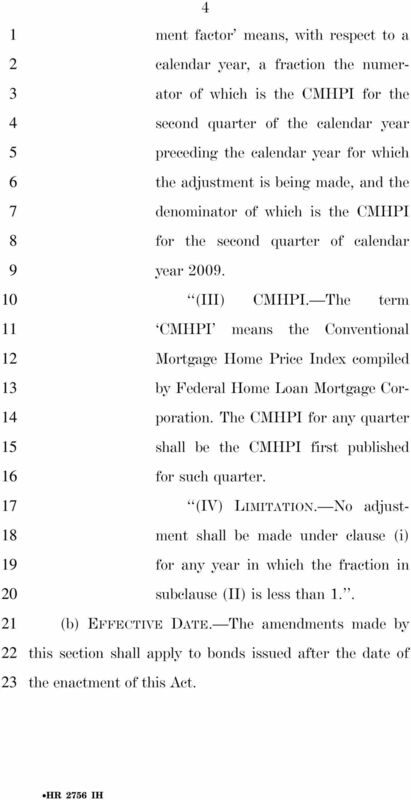 Download "H. R. 2756 IN THE HOUSE OF REPRESENTATIVES"
2 hsrobinson on PRODPC with BILLS 0 HR IH VerDate Nov 00 : Jun 0, 00 Jkt 000 PO Frm 0000 Fmt Sfmt 0 E:\BILLS\H.IH H SEC.. 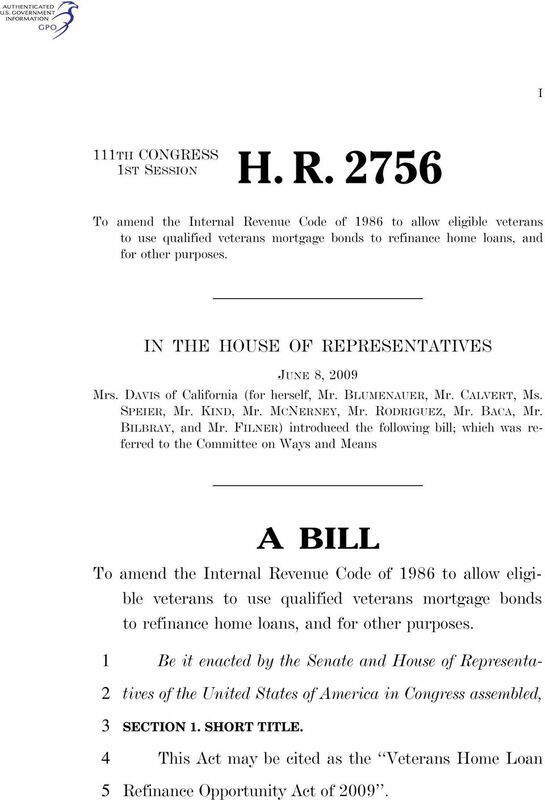 MODIFICATION OF QUALIFIED VETERANS MORT- GAGE BONDS PROGRAM TO ALLOW ELIGIBLE VETERANS TO REFINANCE CURRENT HOME LOANS. 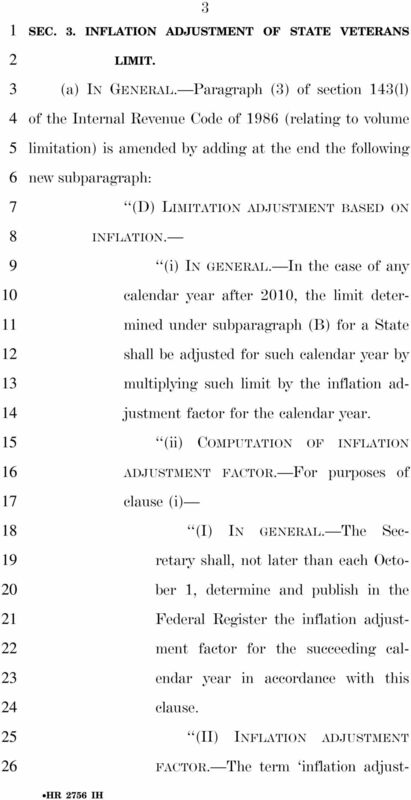 (a) ELIMINATION OF REFINANCE PROHIBITION FOR VETERANS BONDS. 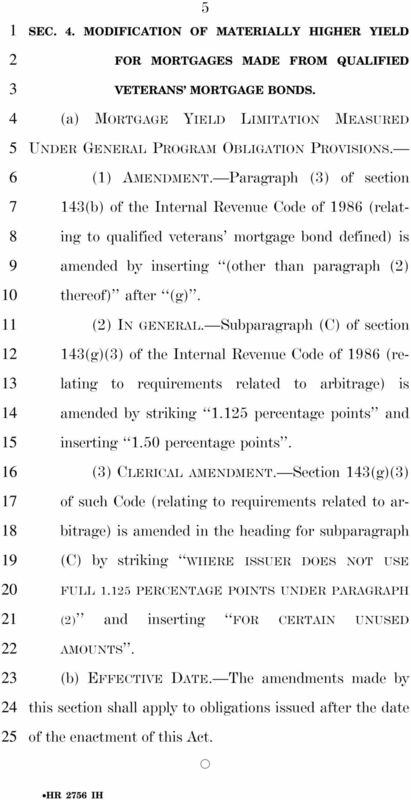 Section (b) of the Internal Revenue Code of (relating to qualified veterans mortgage bond defined) is amended () in paragraph () by striking residences and inserting residences or qualified refinancing loans ; and () in paragraph () by striking (i)(),. (b) DEFINITION. 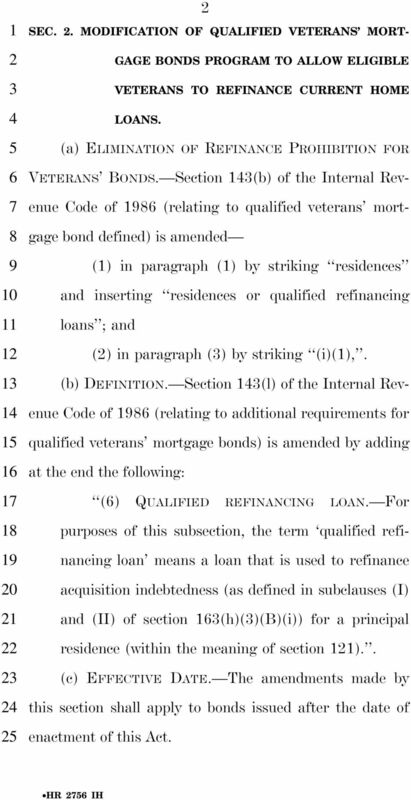 Section (l) of the Internal Revenue Code of (relating to additional requirements for qualified veterans mortgage bonds) is amended by adding at the end the following: () QUALIFIED REFINANCING LOAN. For purposes of this subsection, the term qualified refinancing loan means a loan that is used to refinance acquisition indebtedness (as defined in subclauses (I) and (II) of section (h)()(b)(i)) for a principal residence (within the meaning of section ).. (c) EFFECTIVE DATE. The amendments made by this section shall apply to bonds issued after the date of enactment of this Act. H. R. 363. To prevent foreclosure of home mortgages and provide for the affordable refinancing of mortgages held by Fannie Mae and Freddie Mac.